A new school year is dawning. It’s a time of joy, new beginnings, and new injury risks. Here are some tips to stack the odds in your family’s favor, courtesy of the Virginia Chiropractic Association. Clothing can itself be life-saving. Reflectors on shoes or garments can make a child more visible in the dark. Also, remove drawstrings from young children’s sweatshirts and jackets– you may be removing a potential choking hazard. Can words make a difference? Absolutely. Peer pressure is as powerful today as it was in prior generations. Have age-appropriate talks with your children about drugs, tobacco, alcohol, and sexual activity. Frame the conversation in terms that your child can relate to, using an ethical framework that is consistent with your world view. For teens, the car is both a powerful tool and risk. Be sure your children understand the risks associated with distracting activities like texting while driving; and outline clear consequences for violations. In Virginia, drivers 18 and younger may not use a cell phone while the vehicle is in motion. iv Be sure that your child understands that violations of state law may mean consequences that are beyond your ability as a parent to mitigate. m. For a 75 pound child, 7 1/2 pounds is the most he or she may be able to safely carry on their back. In addition to stressing young frames and growing structures, heavy backpacks cause acute injuries. In fact, a study in Pediatrics showed that emergency room visits associated with backpacks are most highly correlated with tripping, with the head and face being the most commonly seriously injured body parts. 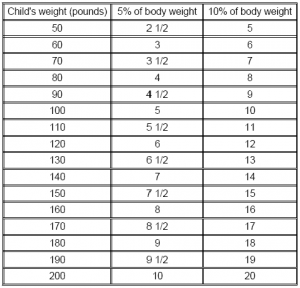 vi Why not protect your kids with a simple device that most of us already own– specifically, the bathroom scale?